Alberta has been experiencing a boom, and yet many Albertans feel they are being passed by. Though unemployment levels are at all time lows, inflation rates are also running at national highs, leaving many Albertans literally out in the cold. Unfortunately, these impacts are not isolated to a small group of Albertans. 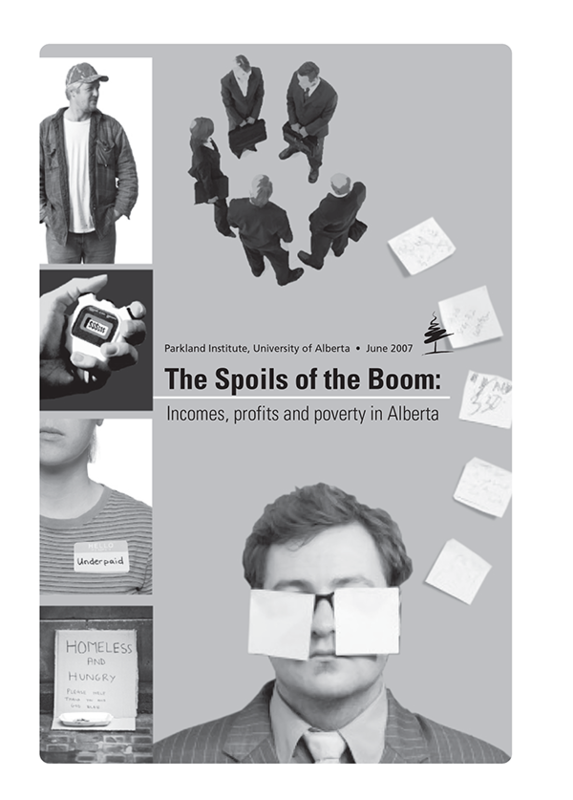 When surveyed, over half of Albertans said they were not benefiting from the boom. The Parkland Institute undertook this study to explore that dynamic. The study profiles a cross-section of Alberta’s economy to illustrate how the dramatic economic growth is being distributed. The findings reveal that middle income Albertans are no better off due to the boom while low income Albertans are worse off. The data also reveals that the benefits of Alberta’s boom are trickling up to corporations and Alberta’s wealthy and high income earners. With unemployment at such low levels, there are fewer Albertans living below the low income cut off. However, for those on a fixed income or who were already employed, the picture is not as rosy. There are still over 56,000 Albertans on social assistance. A look at homelessness, social assistance incomes and minimum wages reveals that many are worse off because of the boom. A rapidly expanding economy, a tight labour market and strong inmigration are putting increased pressure on housing prices and rental markets across the province. Over 2006 and the first half of 2007, new homes in Calgary increased by 65 percent while the average single family home and condo selling price jumped 52 percent in Edmonton. Vacancy rates are also falling. Of Alberta’s 11 census jurisdictions, seven saw their vacancy rates fall below one percent, while two recorded a rate of zero percent. This is causing rent increases far in excess of inflation. Between October 2005 and October 2006 the average rent for a two bedroom apartment increased by 10.4 percent in Edmonton and 18.3 percent in Calgary. This has caused a crisis in homelessness across Alberta. In 2006 homelessness in Edmonton increased by 19 percent while in Calgary there has been 458 percent growth in the number of homeless people since 1996. There has also been a rise in the numbers of Albertans at risk of homelessness. For example, in Calgary, there are at least 20,000 people with a family income of less than $15,000 who are paying more than 50 percent of their income for housing. In spite of the record wealth being created in Alberta, and a recent increase in minimum wages, Albertans are still earning the lowest minimum wage in the nation. Alberta’s minimum wage has not been keeping up with inflation. In fact, the 2005 increase in no way brings the minimum wage in line with the booming economy; it only just captured the inflationary loss of the previous few years. For comparison, the minimum wage was almost 50 percent higher during the boom of the 1970s. Another area where the benefits of the boom are not being seen is in social assistance rates. Again, those rates are not indexed to inflation and, like minimum wages; their value is constantly being eroded. According to the National Council on Welfare, “Lone parent families in Alberta, Canada’s richest province, received just $12,326-only 48 percent of the poverty line.” These individuals and families are being hit hard by the boom as rent increases and inflation eat away at their limited incomes. This study found that the benefits of the boom are disproportionately going to high income Albertans, most notably the top income bracket. Middle income Albertans have seen a small increase in incomes. However, to explain why so many Albertans say they have not benefited from the boom, the income data is set into the context of working hours. A notable increase in working hours confirms that it is not the benefits of the boom we are seeing but families working harder to maintain their standard of living. This is also supported by data on hourly wages which have not been keeping pace with the high levels of inflation. An examination of profits and corporate revenues reveals that high income Albertans are not getting all of the benefits of the boom. Much of the economic growth is going to corporate profits, increases for corporate executives and dividends to shareholders, mostly foreign. Alberta’s strong economic growth has been closely paralleled by a steep growth in corporate profits. In February, 2007 Statistics Canada released a report that corporate operating profits had reached their second consecutive record high in 2005. The oil and gas sector has led this growth. The bulk of this is benefiting foreign corporations and foreign shareholders. According to Statistics Canada, close to half of the assets and over half of the revenue in oil and gas extraction in Canada are foreign-owned. To get a sense of the Alberta context, Parkland conducted an analysis of ten Alberta based oil and gas corporations. Average revenues in 2005 for the ten companies considered were $5.2 billion each, an increase of 26.5% over average revenues in 2004. The average return on investment increased over the period from 21.7% in 2003, to 23.1% in 2005. Consistent with the trickle up trend, executives have seen their salaries and bonuses increase over the last few years, especially when stock options of up to $7.4 million are included. Dividends are also up. Average dividends were $213 million in 2005, an increase of 28.6% over 2004. The province has been experiencing dramatic uncontrolled growth. However, this report has shown that the boom is passing the average Albertan by and lower income Albertans are falling farther behind. Where incomes for middle class Albertans rose, it was mostly due to working more hours, not higher wages. For those Albertans at the bottom, their incomes are falling; social assistance rates are at 50% of the levels of the 1980s, and minimum wages are not keeping up with inflation and are still amongst the lowest in the country. Homelessness rates have also been skyrocketing and increasing numbers of Albertans are at risk of homelessness. The strong GDP growth Alberta has been experiencing is trickling up not down.Only Alberta’s richest 10% of families saw their incomes rise significantly. Alberta’s boom is being seen mainly by corporate executives in the form of salary increases and bonuses, high income earners, corporations in the form of unearned profits, and foreign shareholders. Mechanisms need to be put into place to ensure that average Albertans actually benefit from the boom. Without these, the bulk of the gains will continue to go to the top ten percent of Albertans and mostly foreign corporations. While immediate measures are needed to address poverty and homelessness, a broader and more comprehensive poverty elimination strategy is needed. Such a strategy could include: indexing social assistance rates and minimum wage to inflation and increasing those rates to above the poverty line; ensuring a living wage; implementing rent controls and an affordable housing strategy; ensuring well funded, public or non-profit childcare is accessible to all; and ensuring adequately funded education is accessible and affordable for all. Achieving this strategy will necessitate that labour rights are strengthened including better conditions for organizing and achieving collective agreements. Other elements of ensuring a better distribution of the boom in the province include ensuring better mechanisms for guaranteeing democracy, improving the mechanisms for capturing extraordinary or unearned profits (such as royalty rates and corporate profits), and reinstating progressive taxes.